As the chart shows, since the early 1990s, or the “Klein years,” students have been paying a significantly higher proportion of the costs towards their education than at most earlier periods in the University’s history. Consistent with the covenant, the provincial government was supposed to be aiming to make post-secondary education in Alberta entirely free. It came closest to this in 1981, in which it paid $10 for every $1 that students put towards their education at the University of Alberta. Things took a terrible down-turn in the 1980s, as the provincial government turned away from its international commitment, and worsened again in the 1990s. 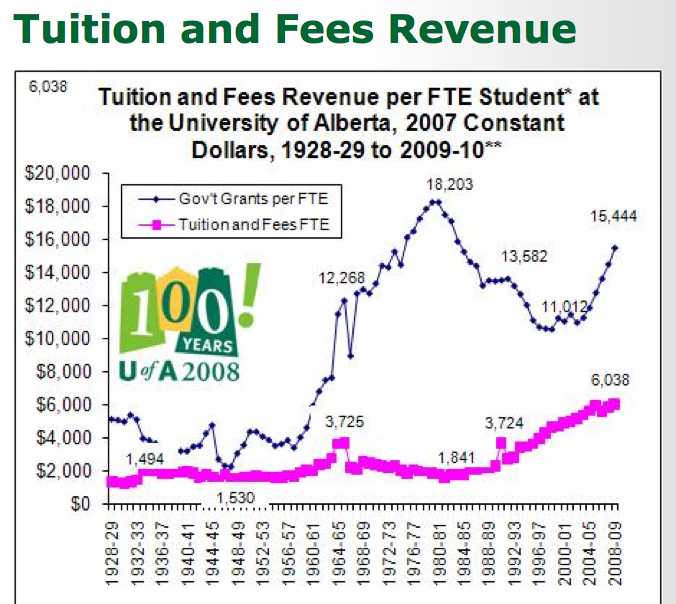 In the first decade of the twenty-first century, as the provincial government began to increase its hard-dollars investment in the form of FTEs, the University began to increase tuition fees. The situation as it stands is that for every $10 that goes to provincial funding of a student’s education at the University of Alberta students must pay $4. We ask that the provincial government and the University Administration remember Canada’s commitment to working progressively towards supplying free post-secondary education to all, and reverse the disturbing trend by which it has chosen to do the opposite, make post-secondary education more costly for students. With its choice, it risks making post-secondary education inaccessible to some Albertans, a situation that is unconscionable for one of the world’s richest democracies. This entry was posted in statistics and tagged free post-secondary education, post-secondary education funding, tuition fees in canada, un covenant on post-secondary education, university of alberta, university of alberta strategic analysis, university of alberta tuition fees. Bookmark the permalink.